This week I was invited by Evans to try out their new Shape Stylist service. For someone like me who has a strong sense of what my style is and doesn't really care what suits my body shape I wasn't sure how it would go, but I really wanted to try it out to see if it might be of help to any of you guys. I know I get a lot of emails from ladies who are looking for an outfit for a special occasion, or are looking for a great pair of jeans for example, so a service like the shape stylists could be really useful. I visited the Evans website on Thursday morning, where a pop up window came up on the screen asking me if I'd like to speak to a Shape Stylist. Clicking the 'yes' option I was taken through to a chat window where I was greeted by my stylist Rachel. I told Rachel about how I'm going away with Michael soon and was looking for an outfit. She then asked me some questions about my dress size, colour preferences and body shape. Rachel was then able to recommend some items to me including a really nice top from the Collection range and a grey marl swing dress. She also gave me some styling suggestions about what I should team the items with. Throughout the process my stylist sent me links to the items and if I wasn't keen on something I was able to say what I preferred and what I didn't. 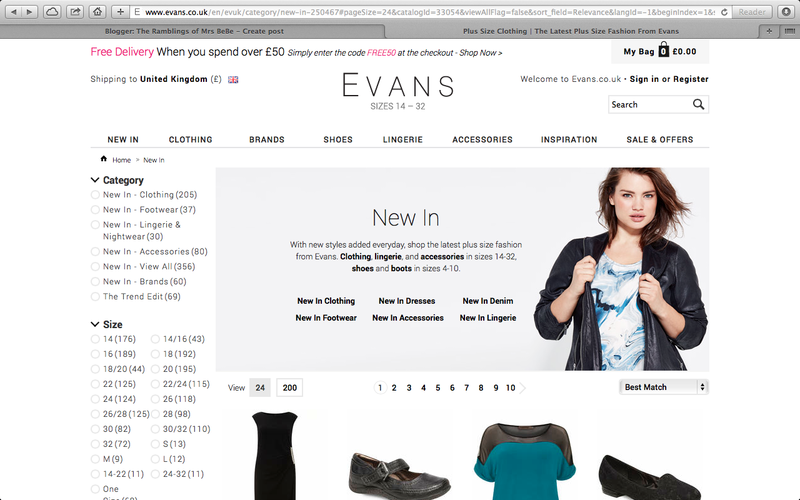 Altogether I spent 30 minutes online choosing outfits for my weekend away. I then went through the checkout process as usual. I opted for the delivery to store option as I live about 3 minutes away, but you can chose home delivery too. I found the whole process really easy and I think it's a really great service if you're not quite sure what you're looking for or find online shopping difficult. It's much easier than trawling through pages of clothing (unless you're like me and actually love doing that, I'm thinking of going semi-pro in the browsing games). The Shape Stylist service is available 7 days a week Monday - Friday 9am-9pm, Saturday 3pm-7pm and Sunday 5pm-9pm. Each stylist is an Evans store member and has experience advising customers in the perfect outfits for them and a large proportion of the ladies are plus size themselves and can advise from personal experience. My outfit choices are due to arrive the middle of next week so I'll pop them here on the blog so you can see what we came up with!